Apropos of the discussion on the news forum of the Sound & Sight director’s and critics’ polls of the greatest movies of all time, I thought I’d post my own list. Be forewarned, though, this is not a list of the X greatest movies of all time, as I don’t think that’s a useful criterion. It invites importing value judgments and what’s fashionable into the discussion. Rather, it is a list of my favorites of all the movies I’ve seen. I am less interested in technique, or even perfection, and more interested in what movies speak to me. It’s also something that can’t be attacked on objective grounds — there’s no disputing that a movie is a favorite of mine, although you can question my taste or sanity as to why a specific movie is a favorite, and I’m glad to answer questions about why I included a certain movie. As for why I excluded a certain movie, in many cases it’s probably because I haven’t seen it. You will notice, however, that there’s little overlap between this list and the Sight and Sound director’s 100. (I haven’t looked at the critic’s 100.) In large part, that’s deliberate; the director’s 100 is dominated by European art films from the 30s through the 70s, many of which I’ve seen, and while they’re fine movies, they don’t speak to or move me enough to be favorites. Also, other than the first movie listed, which is my favorite movie of all time ever and has been since I first saw it close to forty years ago, the movies are listed in no particular order. I’ve included the director’s name in those cases where I remember it, but haven’t made a point of looking for it if I didn’t. In some cases, I’ve included the name of the production company instead. It might also be interesting to make a list of well-regarded films that would never show up on one’s list of favorites (i.e., that one dislikes, despises, or considers overrated). In most cases, I understand why others like them, and I see their technical merits, but the films themselves leave me cold. However, I don’t know whether to do that in this thread or to start another thread for it. Totoro and Gauche the Cellist are unique because they work without villains. I had planned to watch Ran and Record of a Living Being today, but alas our region free DVD player has stopped working, and so I am locked out of region 1 DVDs. Although I have some region 2 copies of both films, I specifically wanted to watch the Criterion editions (especially with Ran, where the colours are different), and since I now couldn’t watch them (unless I tried watching them on my computer, which I don’t really want to), I suddenly found myself with 5 extra hours for this Friday afternoon. So, I decided to tackle the challenge that lawless posed for us. Pretty soon I realised that I couldn’t possibly list my “top whatever favourite films” because that would run into hundreds of films, as I’m totally unable to rank these things based on their quality. So, instead of listing “the best films”, I decided to list films that have, in one way or another, been the most important to me over the years. And to keep the list reasonably short, I limited myself to 20 titles. Which wasn’t easy. After a couple of hours of going back and forth with titles, I came up with the following list. It is in an alphabetical order. And as it was made today, it reflects my today’s mood and what I can remember. I have probably forgotten to consider films that definitely should be here. The scope of 2001 is amazing, as is Kubrick’s direction. This film is like most of my dreams. Except that Coppola directs slightly better than I do. Egoyan is most probably my favourite living filmmaker. Ararat is most probably my favourite film by him. If there is anyone making films today with whom I would connect more than I do with Egoyan, I’m not aware of that person. Scott’s got the best eye in the business today, and Blade Runner already showed it. But it’s not just visuals (or the soundtrack! ), but there is also an interesting story and themes in there. And what’s even better is that today, the film comes in a number of different versions. Blade Runner may well be the film I’ve seen most often, although on my last viewing I was, for the first time, left a little unsatisfied. I’m now afraid to watch it again, and I haven’t seen it for the last three or four years. My favourite Chaplin film. So funny, so touching, so honest. So Chaplin. It may not be particularly well written (by Prince) or well directed (by Prince), and the film looks like it’s been largely shot on the sound stages at Paisley Park studios (by Prince) with performances (by Prince & co) that are amateurish to say the least, but it has absolutely brilliant music (by Prince) and it has Ingrid Chavez (not by Prince), and there is something that I absolutely love about this film (maybe Prince?). A guilty pleasure. Or maybe Lost Highway? Mulholland Drive? I don’t know. Lynch speaks to me, especially his later films. It’s always a journey. Or at least it’s a trip. My favourite Tarkovsky. I’m not sure why. As for why Tarkovsky should be on this list… well, do I really have to answer that? It was going to be either this one or Casablanca. And my arithmetic says that Huston + Bogart + Hammett > Curtiz + Bogart + Bergman. Not by much, though. Actually, my favourite Allen film is Stardust Memories, but I still automatically typed in “Manhattan”. I’m sure it’s for a reason. I haven’t seen either film for ages. The scope of Metropolis is amazing, as is Lang’s direction. I think I have seen this film only twice, and both viewings were within a single week, some 17 years ago. I have no idea if I might still like it. But it’s been a huge part of me. Cronenberg in general is. It may not be Kurosawa’s best, but it’s the one dearest to me. Peter Greenaway, you either love him or you hate him. I love him. I wasn’t sure whether to select this one or The Cook, the Thief, His Wife & Her Lover, but this one’s based on my favourite play of all time, so I think I selected well. This reminds me that I need to watch the other Dreyer films as well. Renee Jeanne Falconetti gives one hell of a performance here. I love Kaufman, and I adore the ambition of this somewhat flawed masterpiece. This was a huge influence on me in my early teenage years. Such a touching, powerful film. And it’s got Sophia Loren, who is a goddess. No, the goddess. I don’t remember anything about this one, except that the girl is crazy. I actually don’t remember much of any other Hal Hartley film, either. I should watch them all again. But I do remember that what he did in the 90s had a sizeable influence on me, and then I watched a little puzzled what he did in the 2000s, and now I’ve lost touch a little bit. Either we grew apart, he changed somehow, or something else happened. But I think that this film still very much belongs on this list. Like many other films on this list, I haven’t seen this for a long time. But I remember having been very touched by it every time I saw it. And it’s got Jennifer Connelly. Who is a goddess. I find it amusing that the only film that shows up on all three lists posted so far is Stanley Kubrick’s 2001: A Space Odyssey. I’ve only seen about half the movies on Fred’s list and even fewer of the movies on Vili’s list. I’ve heard of virtually all of the directors, but in many cases, I’ve seen none or few of their films. In the case of Metropolis, though, I definitely like Lang’s later film, M, better. I thought about listing a Woody Allen film and decided not to, but most likely either Manhattan, Annie Hall, or Interiors — a non-comedy that was not particularly well-received, but resonates with me because the depressed, suicidal mother reminds me of my mother, who suffered from major depression for more than three years until she died of a heart attack when I was fifteen, and which is the most personally meaningful of his movies to me as a result — belong on my list of also-rans. I left Ikiru off my list because it’s a smidge too sentimental for me and I think it has some structural problems, particularly in the middle. As for Ran and One Wonderful Sunday, they’re both too unflinchingly dark and depressing to be favorites, although I can certainly see why someone would pick Ran — it’s a very powerful, almost overwhelming film. I have yet to see Dreams or Madadayo; perhaps they’ll be on my list once I do. Vili – I hope your region free DVD player is fixed or replaced soon. I share your reluctance to watch movies on the computer. I don’t find it a good way to watch them. Also, where would be a good place to post a list of movies that have their merits and often show up on such lists but which I find overrated or dislike? Here or in a new thread? lawless: I find it amusing that the only film that shows up on all three lists posted so far is Stanley Kubrick’s 2001: A Space Odyssey. I think it’s actually quite understandable. It’s a very unique film. lawless: I’ve only seen about half the movies on Fred’s list and even fewer of the movies on Vili’s list. I was curious, so I watched this one yesterday to see whether it actually belongs on my list. I remembered absolutely nothing about it, and I think that I had actually mixed it up with Hartley’s second feature, Trust, which I also watched yesterday evening and considered a better film. But one reason why The Unbelievable Truth has probably been in my mind recently is that one of the main characters is terrified about nuclear annihilation. It’s not Record of a Living Being stuff, but there is a link. lawless: In the case of Metropolis, though, I definitely like Lang’s later film, M, better. I have nothing against M. It’s a very good film. But for me, Metropolis is something that exists on an entirely different level. Have you read the comic book? I didn’t like how they changed many of the core elements for the film, as it now felt very much like a dumbed-down Hollywood version of the book. I didn’t think that it was a bad film as such, but I guess I would have enjoyed it more had I not known the work it was based on. But for me, V for Vendetta would probably never belong to my “best” list, even if it followed the original book as closely as Watchmen (another Alan Moore adaptation) did. There’s just something that is inevitably lost in translation from Moore’s comics, and I’m not sure if that void can be filled by cinema. Even if I really liked the Watchmen film a lot. lawless: Also, where would be a good place to post a list of movies that have their merits and often show up on such lists but which I find overrated or dislike? Here or in a new thread? I think that it could probably have its own thread. But I’ll just mention that from the ones listed here, I personally find that I don’t like Christopher Nolan or Alfred Hitchcock anywhere near as much as a lot of other people seem to do. Both are competent film makers, and neither has probably made something that I would call a “bad film”, but I’m just not in sync with them at all. Pixar is another one that I wanted to comment on here. I liked some the early films — Monsters, Inc. was my favourite — but I feel that they have practically been making the same film over and over again, and from Finding Nemo onwards I’ve become increasingly bored with their films. But maybe I’m not really part of the intended audience. lawless: Vili – I hope your region free DVD player is fixed or replaced soon. I share your reluctance to watch movies on the computer. I don’t find it a good way to watch them. It looks like I need to replace it. As my htpc is also past its best before date, and so is my TV, I think that I will need to consider updating everything in one go. I’m just really bad at deciding about these things, so it may be months until I end up buying something. I have a fairly large and good quality monitor for the desktop computer, so actually watching films on the computer is quite ok. The bigger hassle would be to circumvent the region locks. I don’t remember if I’ve made the computer drives region free, or whether I should use some programs for that. Too lazy to look into it right now. Vili – Ahaha, you’ll probably find my list of well-regarded films I think are overrated or which I dislike interesting, as there are two Christopher Nolan films on it. So I can definitely appreciate your take on him, as for me he’s hit or miss. Some of his stuff I like and think is great (The Dark Knight and The Prestige, which I hadn’t even known about until a friend mentioned it to me), and some I think is pretentious and tedious (Memento and Inception). I’ve seen one Hal Hartley film — I think its name is Harry Fool (it’s definitely a man’s name followed by the word fool) and thought about putting it on my also-ran list, but I’m not quite fond enough of it for that. I remember thinking it was interesting and well-done, but quirky. And I think anyone who’d pick Metropolis over M is crazy. 😉 More seriously, with Metropolis, all I remember are the sets. With M, I remember the people and the plot. That’s always an indication that a movie has sunk its hooks into me and stirred my emotions. No, I haven’t seen the graphic novel that V for Vendetta is based on, although I have looked for it at my local library. I get that I probably wouldn’t like the movie as well if I’d seen the book; I gathered as much from reading the movie’s reviews. But since I haven’t read the book yet, I’m still fond of the movie. I have also grown a little weary of Pixar. I didn’t see Cars (my husband and daughter did; I think I was still working when it came out and just didn’t have the time to go), didn’t like Wall-E, and haven’t seen any of their subsequent films, although I understand that Toy Story 3 and Up were both pretty good. Finding Nemo is on my list mostly because of the visuals, which are stunning, although I also like the story and the character of Dory in particular. Now that I think about it, maybe The Incredibles (which I think postdates Finding Nemo, although I’m too lazy to look it up) belongs on my list of also-rans. In addition to The Incredibles, I’d like to add Sliding Doors to my list of also-rans. Writing about Memento made me think of it. I’m also glad to know that I’m not alone in my love for Drunken Angel. It’s the earliest of those Kurosawa films that I really love, although I have to confess to a sneaking love for No Regrets For Our Youth despite its weaknesses. I think overall One Wonderful Sunday is a better and more consistent film, but it’s a bit of a downer and I have no particular desire to see it again, whereas I would watch No Regrets again. As for the issues with your DVD player, I hope you can resolve them more quickly than you think you’d be able too. I also have a large and good quality monitor, but I find sitting at the monitor to watch a movie uncomfortable and distracting. The doors on the den are louvered, so I can’t keep other sounds out completely and need to keep the sound up high to compensate, and sometimes images are so dark that I need to turn the light out in the room to see them. It had never occurred to me that my computer’s DVD drive might be region-locked as well. I’d always assumed they were region-free. And after looking at a weird Guardian best current directors list here, I’m adding Paul Thomas Anderson’s Boogie Nights to my also-ran list. I’m a bit late to the party here (software problem meant I’ve been locked out of the Internet for over a week). I’ve been thinking this over a bit, and to be honest, I come up with a different list in my head every time I do it. So here is todays list. It is not my list of ‘best ever’, its really my list of films I love and can justify as one of the best ever. I’ve also twisted it a little to spread the genres a little. It just is cinematic perfection as far as I’m concerned. I first saw it when I was too young to understand the satire, but I still found it hilarious. My admiration for it increased all the more when I realised just how daring it is. I think its Kubricks finest moment, mainly because for once he wasn’t so po-faced about everything. Its hard to pick a favourite Ozu, but for me this just has a slight edge. For all its greatness, I think Tokyo Story is a little too preachy and didactic at times, I find this film has an almost infinite depth of mystery underneath its simple storyline. I also love the more recent 35 Shots of Rum a French remake/tribute from Claire Denis. There are numerous versions of this out there, with TV length edits, original cinema cuts and ‘directors cut’, etc. But they are all fantastic. This is another film I saw when I was too young to really understand the metaphor, I thought it was the most gripping and terrifying film I’d seen up to then. It still is, I think. I think this is the most deeply romantic film ever made, as well as one of the most beautiful. Its a close call here between this and my other favourite Won Kar-Wei film, Chungking Express. Totally insane film, I really wonder if anyone making it had a clue what they were doing, but its still awesome. Slightly cheating here, as this is also my favourite short story (from James Joyce) and it so happens I live about 2 minutes walk from the house it is set in. But it is my favourite John Huston film, and I find it very moving that he was dying when making it. It is a wonderful chamber piece in its own right. I know very little about the director or Turkish film in general, but of all the most recent films I’ve seen, this one has haunted me the most. I see it as almost a companion piece to Rashomon. While Rashomon suggests that ‘truth’ may be impossible to grasp, this film instead suggests that it is not just impossible to find, but sometimes it is better not to find it. I think this is the only film I’ve ever watched, then immediately went back the next day to see it the next day… and the next! A perfect distillation of the glories of cinema. Ones I’d list on other days… oh, so many! I’ve left out at least half a dozen Kurosawa films I love so much. Woody Allens Manhattan is a film I love, but it just misses the cut for me. I love the screwball comedies from the 1930’s, but I can’t quite think which is my favourite – maybe The Thin Man or It Happened One Night or Bringing Up Baby or The Front Page. I think Before Sunset and Before Sunrise are among the best modern romance films. The Good, the Bad and The Ugly is maybe my favourite western. I’m also a bit conflicted about my favourite Scorsese – its probably Goodfellas (which also just slightly missed the cut). And just looking through what I’ve written I can’t believe I left out Pulp Fiction, but I don’t know what I’d leave out to let it into my top 10…. Wow, You guys are amazing! I can’t do it…where do I even begin? I mean, for real! We all start so early with films! Bambi, Snow White and the Seven Dwarves, The Music Man-all had an incredible, formative effect on my psyche! The Cabinet of Dr. Caligari, Un Chien Andalou…Oh, it is useless to even try to think of all the films that have been important to one, and why…I leave it to you guys!!!! I can’t resist a list. Ok, this is not me trying on my critic’s cap but simply listing my favourite films, more or less. Strange mix, lots of westerns. No need to explain why I love all of these. Really one of the best movies ever made – it has been on my top two list for years until High and Low and Seven Samurai bumped it down. Loved the crazy gothic feel. Gorgeous movie and it creeped me out for weeks! The rhythm of this movie was something else. I’ll never forget the scene with the Korean grocer. I loved the feeling of this film, the extraordinary care he took in choosing the exact music for every scene. (He always does, but I was really struck by it in this wonderful story). So dark so rich – Martin Landau was unbelievable. does it belong on this list? I think it does. Kevin Spacy. Need I say more? My first Almodovar, and I loved every second of it. I am afraid to see this movie ever again. It had such an impact on me. — Don’t laugh. I’ve seen so many Hamlets, ending with Brannaugh’s version (which I hated). I was so surprised that Gibson pulled it off, and actually quite beautifully. My favorite comedy of all time. Brilliant. Went in expecting to just occupy a seat next to my Superhero loving son, ended up loving it. Starring Edmund O’Brian – terrific Noir at it’s best. This got under my skin for years, I think I was about 15 when I saw it on a local TV station. Wes Anderson plus Jason Schwartzman = my cup of tea. As I was writing these, so many more came to mind but I must stop! Except, sorry, had to add Rocky Horror Picture Show. High on my list in my formative years!!! The Philadelphia Story Loved this sweet film. I forgot all about it. Let’s face it. I just love watching Toshiro no matter what. These aren’t my favorite Kurosawa but they do fall into my almost ran category. By the way Ran isn’t on my list because I haven’t seen it yet! Spirited Away I love to watch Miyazaki, but his stories are always so odd to me that I have to watch them a few times to “get there” with the film. Mary Poppins Probably should have added this since it was the film, besides My Fair Lady that I saw the most times in my childhood. Unlike Lawless, I have never liked Wizard of Ozand I can’t really figure out why. Even the book (not the play) Wicked really creeped me out. And talk about traumatizing my childhood. I saw this movie once alone with a babysitter at night when I was about eight. I will still never forgive my parents for letting me alone with that woman! Why Fred, how charming of you! Prospero’s Books Have always had these on my list Vili thanks for reminding me. Ararat – Now I must see it. This is one of the movies that, like Star Wars and Toy Story was a “First” for most everybody. I mean we had never seen anything like that before and it was so thrilling! I watched this multiple times too – probably should have been on my list. Wow, I remember sitting in the theater unable to breathe, I felt so claustrophobic watching this. It was amazing and I went back that week and saw it again. Later in my life i saw it dubbed in English which ruined it. I realized that part of its power was the sound of the German language. Also must mention that for years my top two were, interchangeably, Wings of Desire and Manchurian Candidate. Don’t know why MC was so far down on my list in my sub conscious. However now those along with Seven Samurai, High and Low and Roshomon could all, at any given day be my number one. O.K. So I also forgot Fight Club, Like Water For Chocolate and Babette’s Feast on my list. Such wonderful lists! I want to thank Ugetsu for throwing in “Crouching Tiger“. I watched it on my laptop on a Chinese train with as many of my new best Chinese friends as could fit on my bed. If you have traveled on a Chinese sleeper, you know what I mean! Such wonderful memories. I cried and cried and had a Chow-Yun Fat crush for quite a while! I am certain it made just that much more monk-crazy, too…when visiting monasteries, I was always quite smitten! lawless has it right- Seven Samurai is on the top! And, she throws in Philadelphia Story-which has the BEST drunken Jimmy Stewart scene….! And, despite some male/female dynamics that smack of male control, (I am unreconciled with the father’s scenes, and some of Cary Grant’s dialogue) it still is a wonderful, glistening, glorious film! Henry Fool, Hartley’s seventh, is next on my Hartley list. I specifically stopped before it as I remember the films that follow Henry Fool not to be as good as the ones that precede it. Not that I have seen his latest work, released earlier this year on DVD. I’m looking forward to getting there eventually. It’s been fun revisiting old friends. Speaking of which, one night I also popped in Graffiti Bridge. It’s still just as marvellously excellent as I remembered it to be. And also a horrible film. But so good. It’s really interesting to see everyone’s lists. I’ve made note of quite a number of films here, and put them onto my pile of “find and watch these films”. I’m horribly slow to watch stuff, but eventually they will cycle onto my screen. And I’m glad to hear you liked Tokyo Chorus, Amnesty! Oh, and Jon!!! Damn. It’s been what, four years since your last appearance here? So good to hear from you. I said I could write another top ten list depending on my mood – and this time I’ve less eagerly censored my Kurosawa references in order to make it look like I watch a wider variety of films than I do (I could still do a top ten with maybe eight Kurosawa films if I was in the mood). 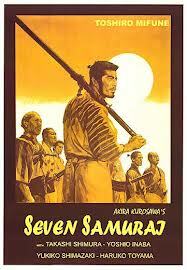 I’ll leave out Seven Samurai as its always, always number one for me. 1. Ikiru. I don’t think a day goes by when some scene from this film doesn’t pop into my head for no good reason. 2. Sound of the Mountain Mikio Naruse. I think maybe the finest example of a literary adaptation I can think of. A tremendously moving film. 3. Yojimbo. Best action movie ever I think. 4. The Wrong Trousers. Funniest film ever as far as I’m concerned. Yes, I know its a short, but watch it twice, its still funnier than any other film. 5. The Quiet Man. (John Ford) Romantic nonsense but it still works wonderfully. I spent a lot of time in nursing homes in years past and it was on almost constant rotation, but I never really got tired of it. 6. Raise the Red Lantern. I’ve become a bit disenchanted with Zhang Yimou as he seems to have sold out artistically, but nothing can take away from the incredible quality of his earlier films, and I think this is the best. 7. La Dolce Vita. Still as powerful and relevant as ever, even if I think its a tiny bit overcooked in parts (but thats Fellini for you). 8. Throne of Blood. Not just the best Shakespeare film, but the only version of any Shakespeare play that I know of that actually tops anything Shakespeare wrote. I’m sure Will would have been on his feet shouting ‘Bravo!’ at the final scene. 9. Princess Mononoke. My favourite animated film without plasticine. 10. A tie between my two favourite films driven by song (not quite musicals), Once from John Carney and Chungking Express from Wong Kar-Wei. I have no explanation why so many of my favourite films are in Chinese or Japanese, despite me not speaking either language! There are quite a few other Asian films I can think of which I could add in on another day. There are a few others I could easily add in which have just occurred to me before reading this – such as Les Enfants du Paradis and Taxi Driver. Oh, and many, many others (and I’m not even a huge movie-goer). Thanks, Vili, for welcoming me back. Yes, it has been about four years I think. It is now ten years since I discovered Kurosawa by taking a chance on the BFI Seven Samurai DVD. Have been very busy bringing up my kids but hope to be able contribute in a small way when the film club includes a film that I have proper subtitles for. Thank you for that. Right on. And, sometimes life is a little overcooked! And too loud, and annoying, and cloying. But some of the scenes are seared on the inside of my eyelids. Whenever I am Rome I am looking for moments that make me feel as if I am inside that film. And, Rome gives them up freely! These are things I truly love. Ranking them definitively is too hard and probably a temporal exercise, doomed to change, so I put them down as they came into my mind just now. 1. Seven Samurai Always on top! That’s right Ugetsu, lawless! Best film of all time, with all our Kurosawa players at the very tops of their respective games, in perfectly-crafted roles more satisfying and meaningful than their short moments on screen! I just note that the setting-this village valley-offers a slightly claustrophobic world not unlike Lower Depths-I think the sets play an enormous role in creating a sense of both belonging and oppressiveness. That the village opens to the flowering hillside-offers hope…in Lower Depths the sky offers hope…but is far-off nearly intangible except through death…or abandoning the “place”! 2. The Lower Depths There is this redolent, convincing set-palpable cold and wind, dark and grime, and a particular blend of dark humor that I find absolutely compelling. One of my all-time favorites for reals! 3. La Dolce Vita An old dirty friend with his old, dirty secrets and boring old stories…the searing scenes relevant to Steiner…! Wow. Just….wow. The “visionary” children and that whole religious hysteria/grubby miracle mongering…and Jesus suspended from a helicopter, Marcello trying to pick up girls on a rooftop. PEOPLE are we serious? There’s so much good stuff here, it’s like a freaking gold mine. 4. Amarcord More like a guilty pleasure. Ciccio Ingrassa….amazing…Magali Noel…! Wow, such luminous, sparkling lives…feels like a memory of my life when I am watching it. I could only wish for so beautiful a life! 5. Yojimbo Oh, the BEST. Miyagawa’s photography…just the choreography of shots..! And, Nakadai! And, of course, our buddy Mifune. Genius. 6. Wings of Desire Ha! Lovely…and so sad. 7. I Was Born…But pretty close to genius. 8. Ugetsu Oh so haunting…no pun intended. 10. Floating Weeds I just loved these people. I watched The Wizard of Oz the other day, which Lawless mentioned as one of her favourites. I was actually surprised that I liked it, considering that on the surface it’s not the kind of a film I would generally enjoy, and I remembered not really liking it when I saw it as a kid. But it was well made, and when anachronistically approached, had a very strong Monty Python vibe to it, which made it all the more enjoyable. Still, I must say that I prefer The Wiz, which I watched right after. It may not be as good a film as The Wizard of Oz, but anything that has the words Motown, Michael Jackson and Diana Ross (among others) as part of the opening titles gets my vote automatically. It was funny to notice how with The Wizard of Oz I was bored through most of the songs, while with The Wiz it was really the songs and dance numbers that did it for me. But I am a funkateer at heart, so I have no choice to think otherwise when my feet start tapping. I also watched The Maltese Falcon a couple of days ago, which was on my list. Still excellent. I am still trying to get to many of the other films mentioned here that I haven’t seen. Just watched V for Vendetta again, and liked it just as much, if not more, than the first time around. It definitely belongs on my list. And having seen Tarantino’s Inglorious Basterds, the look and feel of the film reminded me of that one if it had been executed with more discipline. Interestingly, the comparison to Tarantino also occurred to my husband, who’s seen at least one more Tarantino flick than I have (Kill Bill, both parts). That’s not to say that there aren’t gaping plot holes, some of which occurred to me as I watched it, like where the roses that Evie piles on V’s corpse came from, but for me, it’s a wholly satisfying cinematic experience. Maybe I’d feel differently if I’d read the source material first, but coming to it without preconceptions may be fairer to the movie as a movie as opposed to as an adaptation. It would be interesting to hear what you think of the comic book V for Vendetta, if you decide to read it one day. It’s one of my favourites in the medium. I actually remember quite little about the film. Just that I thought the screenplay was way dumber than it needed to be, the direction felt uninspired, and I didn’t like Natalie Portman’s performance (but then again, I rarely do). I haven’t really seen many films lately, pretty much just Life of Pi and Seven Psychopaths in the cinema this week. They are the only two films I’ve seen in the cinema this month too. I loved Life of Pi, Seven Psychopaths was fun, but a little too self-aware for my taste. I thought that Life of Pi was quite pretty but also lacking of content in the end. Maybe I very much misunderstood the film, but it felt very simplistic. Pretty, though. Seven Psychopaths I liked more, but I totally agree with you that McDonagh couldn’t quite pull off the Charlie Kaufman style self-awareness with the film. I also noticed that after half a dozen plays and two feature films, I’m starting to know what McDonagh’s characters are doing or saying next, which does take away from the enjoyment of being surprised by the author’s wit. I’m still eager to see what he does next, of course. Will do. I may pursue this through the rabbit hole of interlibrary loan. The internet catalog is a pain to deal with, but it’s the one way I can legitimately get my hands on it without paying for it. Being unfamiliar with the source material, I thought the screenplay was not dumb at all and that the movie relied on imagery and emotion to fill in for the concepts I assumed the original dealt with at more length. I’ve also read a lot of other dystopias, so there’s a lot my mind will fill in without having to be told about it. I thought the echoing effect of people watching TV, and what that says about the control of media over our lives and what’s real and what’s not, was effective. Portman doesn’t bug me the way she does you, although this time around I wondered what the character would be like if played by Louise Brealey, who plays Molly Hooper on Sherlock BBC. Brealey might bring more of an Everywoman sensibility to the role. Just to show you how mainstream my tastes are — I saw The Hobbit: An Unexpected Journey and mostly didn’t love it, although I’m a fan of Tolkien and of Jackson’s LotR movies. The last movie I saw in the movie theater before that was The Dark Knight Rises, which had its moments but isn’t nearly as strong as The Dark Knight. There’s been some discussion about going to see Django, Unchained. It’s always difficult to find films we both want to see. The movies I saw this year that I liked best were all on digitally recorded from the TV or rented: Inglorious Basterds, Street of Shame, Shame, and The Big Sleep. Shame was the only one that was close to being new. Street of Shame was, imo, the best of them, although Shame was probably the most thought-provoking. The Big Sleep would rank higher if the plot wasn’t so convoluted. It and Shame should probably be on my list of also-rans. My reaction was probably pretty coloured by the book. I have seen V for Vendetta only once, when it came out. But if I remember correctly, the film seemed to take the issues of the novel, which were borne of the Thatcher era, and attempted to transport them into the Bush era USA. This in itself is of course not necessarily a bad thing. But in the process of adaptation the story seemed to lose much of its original ambiguity and complexity, while adding plenty of Hollywood cliches. For example, a rather clear good vs. bad theme seemed present in the adaptation, which the comic does not really have. The film V seemed like a romanticised (super) hero, a freedom fighter, whereas in the book he is an anarchist, very much a terrorist, and on top of that a somewhat unstable human being. The book makes it tough to choose between the fascists and the alleged hero. In the book, V’s relationship with the girl is similarly more complex, and pretty much lacks any of the romantic side, which felt like a very Hollywoody addition to me. The girl’s story arc is also more interesting in the book, and you are left wondering whether V’s style of brainwashing her is any better than what the fascist government is doing. The other characters, including those working for the government, are similarly much rounder and complex in the book. Also in terms of its presentation, the film didn’t seem to be similarly multi-layered as the book, which is (typically to Alan Moore) very intertextual, and visually rich. But as I said, I have only seen the film once (I think I’ll need to give it another go once my new TV arrives! ), so it may well be that I missed much of that. Now, obviously there is much more time and space to develop a story in a 300-page comic book series published over seven years than there is in a two hour film. And perhaps moving away from the Thatcher-influenced dystopia was necessary for the film to get made. But I felt that by changing certain core aspects, some of which I mentioned above, the story lost quite a lot, indeed too much, and the screenwriters failed to introduce much new that was truly worthwhile. Indeed, what they added largely seemed to come straight from a book of storytelling cliches. The result felt like a mediocre film with lots of potential but little thought put into it. But, as I said, I have seen the film only once, some six years ago, and watched it through Alan Moore tinted glasses, having read the book at least half a dozen times. And it is certainly not my intention to convince anyone to like the film less than they do. 🙂 I just simply wanted to explain where I’m coming from. And now I want to watch the film again. And read the book, too. Anyway, I’m very curious to hear your views on the book if you manage to get hold of it one day. It’s gotten good reviews. I wanted to see it this week, but alas it only opens here in mid-January. There is plenty of other stuff to see though: the new Ewan McGregor film (The Impossible), the new Richard Gere film (Arbitrage), the new Ben Affleck (directed) film (Argo), the new Sarah Polley (directed) film (Take This Waltz), maybe even the new Wachowski film Cloud Atlas (but mainly because my wife wants to see it), these all have recently premiered here (or will premiere this week) and look like potential films to watch in the cinema. I saw The Hobbit in 2D without all the tech candy, and can tell you from other people’s reaction that the 3D and 48 fps might not make that much difference or might actually make it worse. But of course it’s up to you; what you like might well not be what I or my friends like. The reviews I’ve seen of Django Unchained so far are pretty mixed, but that’s not surprising given that in the US you have the added layer of Tarantino, a white man, making a movie about the black experience and Tarantino’s penchant for letting scenes go on too long, something I noticed in Inglorious Basterds. On that score, I’m looking forward to Shame director Steve McQueen’s Twelve Years a Slave with Chiwetel Ejiofor as main character Solomon Northrup and Michael Fassbender, Benedict Cumberbatch, and Brad Pitt as supporting characters, which should be coming out in 2013. I figured that the characters in the book version of V for Vendetta were more complex. The love interest subplot in the movie struck me as the weakest one; I’m not surprised that it was an addition. But the movie did raise, for me at least, the question of the ends justifying the means and whether V himself was any better than those he aspired to replace. To my mind, it’s harder to make a movie that doesn’t take sides than a book; because of its visual aspects and its being told from one POV (generally), movies are inherently more slanted than books. I think the movie might have lost some of its power if it had been more equivocal. Indeed, many people don’t seem to like the 48 fps version of The Hobbit, which is pretty much why I would like to see it. 🙂 The story itself doesn’t really interest me that much, although I did like the Lord of the Rings films. I haven’t actually read any reviews of Django Unchained, but it was certified fresh by Rotten Tomatoes, so I assume it’s gotten more positive than negative reviews. It’s an interesting theory you have about films being inherently more subjective than books. I never thought about it, but there may be some truth to that! Special mention for The Misfits for not being anything spectacular but at the same time so utterly fascinating. 5. Toss-up between The Bad Sleep Well and The Lower Depths.